Need proof that rose gold is definitely sticking around in 2018? Look no further. 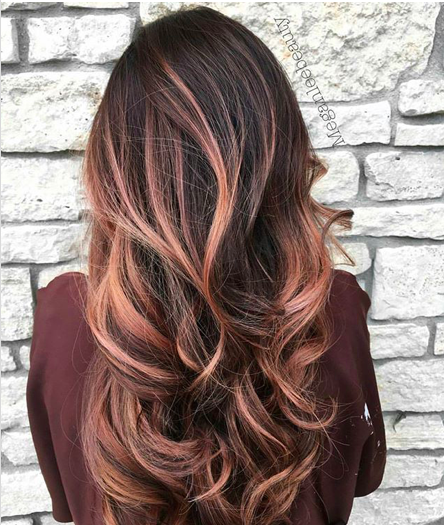 When we posted this dreamy rose gold balayage from stylist Megan Bills (@meganleebeauty) on our Instagram, it had racked up more than 14,000 likes in a matter of hours, and EVERYONE wanted to know how she did it. Below, Megan breaks down her formula (she used Aveda color) and process, so you can get the look in your salon. 1. Apply Formula A to the roots, and comb down about four inches. 3. Process until the midshaft reaches a Level 9 and ends reach a Level 10. Note: the midshaft will be a tad brassy, which is perfect for this toner to enhance the rose gold color. 4. Rinse, shampoo with Aveda Damage Remedy Shampoo and towel-dry at the shampoo bowl. Then apply Formula C all over, in sections if needed. Process for 5 to 10 minutes. 5. Rinse with cold water, shampoo and finish with Aveda Damage Remedy Mask.